South Korean police say they have arrested a man accused of setting fire to the birthplace of the father of embattled President Park Geun-hye. 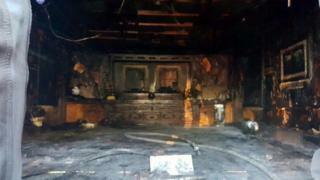 The memorial hall for Park Chung-hee, the country's former military ruler, was badly damaged in the blaze. Police quoted the suspect as saying the president should have resigned or killed herself, South Korean news agency Yonhap reported. Ms Park is facing protests and possible impeachment over a corruption scandal. The house where Ms Park's father was born, in the southern city of Gumi, is a tourist attraction, especially among supporters of the Park family. Police said the suspect told investigators he used paint thinner to set fire to it, the Associated Press news agency reported. Ms Park has not commented on the incident, though she made her first public appearance in more than three weeks on Thursday, visiting a century-old market in her hometown that had also been damaged by fire. The cause of Wednesday's blaze in Daegu is still being investigated. Parliament is due to discuss on Friday whether Ms Park should face impeachment amid an investigation into whether she allowed a long-time friend, Choi Soon-sil, to influence political decisions for personal gain. The investigation focuses on alleged abuse by Ms Choi, the daughter of the leader of a pseudo-Christian cult, of her closeness to the president to enrich herself and influence policy, as well as her handling of classified documents. On Tuesday, Ms Park asked parliament to help her find a way to stand down. She has apologised twice before, and has said she is "heartbroken" by the political crisis, but has refused to resign. In recent weeks, hundreds of thousands of Koreans have joined huge street protests across the country demanding that she leave office. Park Chung-hee ruled the country from 1961, when he took power in a military coup, until 1979, when he was assassinated by his security chief. His rule was authoritarian, but he is credited with industrialisation which brought the country out of poverty in the wake of the Korean War.